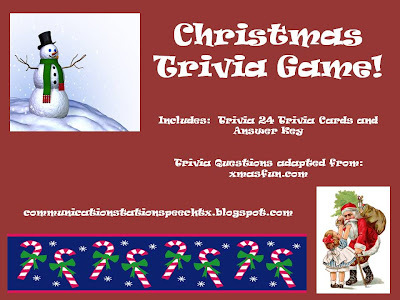 Freebie Friday Flashback: Christmas trivia game FREEBIE! Flashback Freebie Friday for you today! Want to play a fun game with your clients or own children? 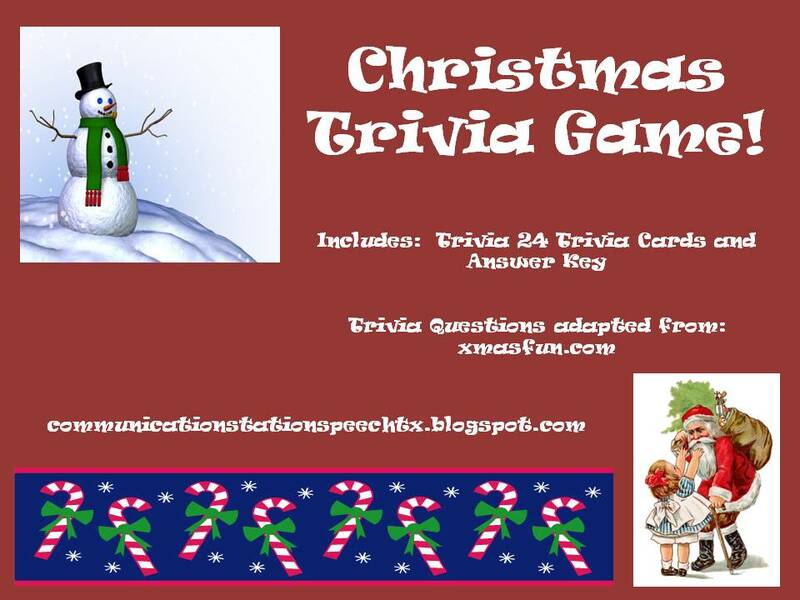 Check out this simple but fun Christmas Trivia game. Perfect for family’s to target speech and language skills at home! Looking for something fun to do the week before Christmas Break? How about playing a Christmas Trivia game? Trivia games are a great speech and language activity! You can target receptive language skills (question comprehension), expressive language skills (answering questions), auditory processing skills (auditory comprehension, memory, and recall), voice and fluency (reading and answering ?s with appropriate voice or use of fluency strategies)…and yes even articulation skills (read and answer ?s with correct production of target sounds). All this speech and language goodness in a fun holiday themed activity! Snag your FREEBIE at the bottom of this blog! ← Tip Tuesday Flashback: 10 Ways to Target Speech and Language during Christmas! Thank you for your article on ASHAsphere regarding “themed” activities I came through the ranks in 1991 and WAS trained in thematic language units and although I have been LOVING all the fabulous clip-art cuties that people have been putting together, I have found most of it un-usable due to lack of cohesion! I am a great fan of your Freebies however specifically because of their thematic nature! My mom was an SLP in the 60-90’s and developed/published a big boxed set of materials (old school style) with Communication Skill Builders that included 20 themed language units (which as a kid I got to help her develop) needless to say I ended up an SLP (ha)! Thanks Again! Thank you so much Tamara for your comment! I’m so glad you are finding my freebies helpful. I do try to stick to true thematic lessons for our language delayed kiddos for sure. Also your mom’s thematic units sound amazing! Not so surprising you become an SLP as well! Hahahahaha! I love it! Thank you for sharing your experience!